My brand new development box (and render target), using a Gigabyte GA-Z97X-UD5H motherboard & Intel i7 4790K processor was showing a strange (read: high) CPU temperature as soon as the processor ramped up to 100%. 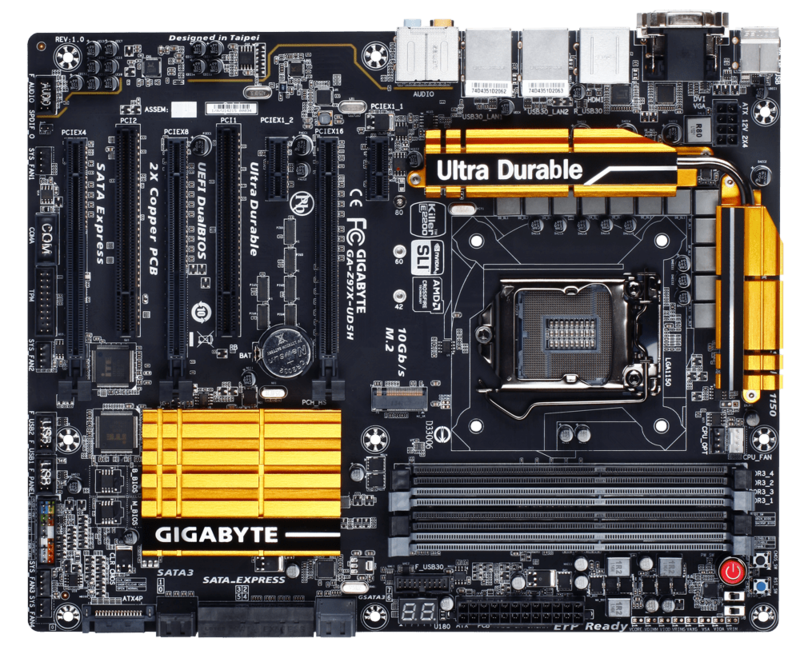 The GA-Z97X-UD5H motherboard. Yup, it looks pretty much like other motherboards, with the exception of those lovely gold heatsinks. If you’re running into the same issue, then I’m happy to say that a BIOS upgrade (from F4 to F8) sorted the issue out. CPU temperatures are now reporting at around 26 degrees C @ idle (which is only around 0.5 degree above ambient in our office…) and 65 degrees C when maxing the CPU out using the Blend setting in Prime95. I’m guessing the problem was just a reporting error, rather than the case of the actual CPU temperature hitting 80/100 degrees, but that is a guess. Incidentally, it’s the first time I’ve used the BIOS on a MB as new as this one, and I gotta say its a dream to use. Mouse & network support, plus plenty of configuration options and a very quick BIOS flash procedure. I like.